The PA is more than willing to talk about revenue building measures even as it refuses to come to the table to negotiate peace. The Palestinian Authority (PA) and Israel are holding economic talks despite frozen peace negotiations in a bid to relieve the PA's deepening debt crisis. Under the current framework of agreements, Israel is tasked with levying taxes and duties on the Palestinian Authority's behalf. 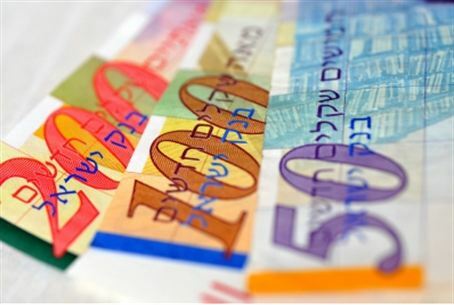 These revenues amount to around USD 100 million a month for the barely solvent PA.
"There are still difficulties, but I hope that we will be able to reach an agreement soon ... both for the benefit of the Palestinian Authority and for the benefit of the state of Israel," Israeli Finance Minister Yuval Steinitz told reporters on Sunday, declining to discuss details of the meetings he described as secret. The PA is reeling from a sharp drop in foreign aid following its unilateral bid for statehood at the United Nations last year. Even Arab nations that supported the bid have failed to deliver on their pledges amid the upheaval of the Arab Spring. In a report released on Saturday, the International Monetary Fund projected that if donor countries continued to withhold promised aid, and if last year's budget deficit of $1.1 billion were to recur, the PA would find itself with a budget shortfall of $500 million. Citing commitments to rein in expenditures and put forward a leaner budget, officials foresee a $950 million total deficit and $330 million financial gap, still a vast sum which is generating deep concern. "The Palestinian government has made great efforts to control public spending this year but cannot hope to fill a gap this huge," PA minister of agriculture Ahmed Majdalani told Voice of Palestine radio. Ramallah hopes increased tax revenue could help prevent cuts to government salaries and social welfare programs. The talks are aimed specifically at overhauling the "Paris Protocol", signed in 1994, under which Israel collects taxes and customs for the Palestinian Authority. "Israel has killed the Paris economic agreement through security measures and closures, and by preventing freedom of movement," Fatah Central Committee member Mohammed Shtayyeh said. "The Palestinian Authority must have sovereignty over its territory." But PA officials are clearly more concerned with cash than peace. Talks on a permanent peace agreement leading to Palestinian statehood stalled in 2010. Israel halted settlement construction in the 'disputed territories' for 10 months to meet PA demands, but was rebuffed and presented with a raft of additional preconditions -- and ultimately, with the PA statehood bid outside the agreed upon bilateral track. PA officials continue to demand Israel accept the indefensible 1949 Armistice lines as borders, free all Arab terrorists from its jails, and again freeze construction before talks can resume. They have also persisted in seeking the inclusion of Hamas in the PA despite the terror organization's refusal to meet the conditions set by the Quartet for Middle East Peace for its inclusion. The Quartet -- the European Union, Russia, United Nations, and United States -- has said Hamas must renounce violence, recognize Israel, and abide by all pre-existing agreements between Israel and the PA.
Israeli officials say the demands are a fait accompli to forestall talks as PA officials have done nothing to prepare their public to make the compromises that would bring peace. PA officials have openly admitted to abandoning the bilateral peace track and adopted "a strategy based on continuous efforts along with the international community to secure full recognition and full United Nations membership, pursuing internal reconciliation, and keeping up the popular resistance."